Want to make your tofu taste better but don’t know where to start? Here’s How to Cook Tofu 101, plus some incredibly helpful tips for making the MOST delicious tofu you ever have! I knew I wanted to write this post about tofu after one of several incidences. The first was, the realization that Gav and I had been buying the wrong tofu, but my readers hadn’t been. The second was after buying the right tofu, that there would still be random friends who would say “I’ve tried tofu before – I hated it.” The third and final push to finally sit down and write this post was when I was told by a reader that they had no idea that they should press tofu and that I changed their entire outlook on tofu. Tofu is DELICIOUS. Tofu is versatile, easy to use, meal prep friendly, freezer friendly. In fact, Tofu is your FRIEND. Instead of dwelling on all the reasons tofu may have been wrong to you in the past, let’s dwell on all the reasons to get it right. When you cook tofu properly AND are using the correct tofu your opinion will change. We tend to view tofu as this one size fits all kind of thing. That we can buy one kind and it’ll work for everything. But (for comparison) we would never buy mince meat and try and make chicken parmigiana with it. 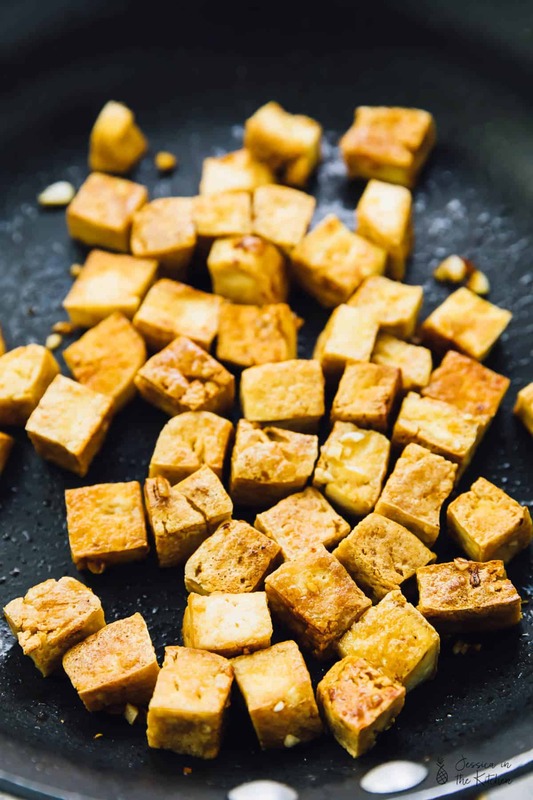 In order to understand why your tofu type matters and how to ensure you’re buying the right tofu, we need to dig slightly into the history of tofu. I promise this part will only take a paragraph or two. Tofu, also known as bean curd, is a food made from soy beans. 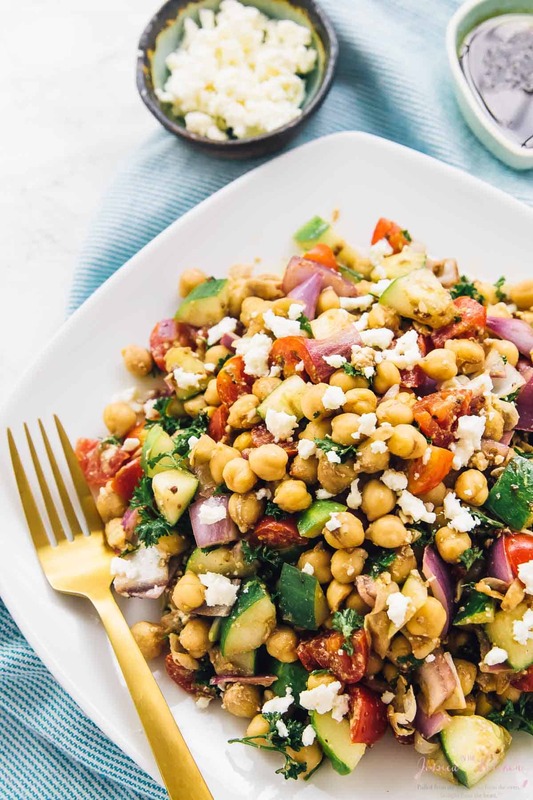 Tofu is often seen as a vegan meat replacement and can be used in everything from vegan meat replacements to cheesecakes to puddings to vegan ‘eggs’ and so much more. One of the things that is asked a lot in relation to tofu is whether it is “real”. Yes, it definitely is. Tofu is actually made from soy milk and there are many videos on Youtube of making it straight from soy milk at home to show that it is just as easy to make at home as many other vegan meat replacers. 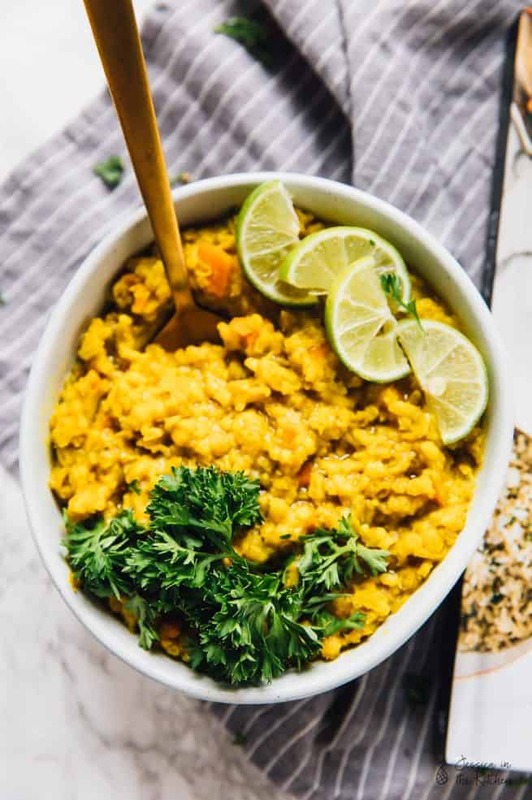 It’s minimally processed and has been a component in East Asian and Southeast Asian cuisines for centuries, just to show that this isn’t some recent invention. Also, tofu definitely has an expiration date (trust me, I’ve personally experienced this one)! If you don’t have any soy issues and buy it non-GMO, it is definitely something to give a try. Tofu is also high in protein so it’s an excellent vegan source for proteins. Okay, I’ll address it – Gav and I were buying the wrong tofu. You see, tofu isn’t that widely explored, especially in Jamaica, so we just saw tofu on the shelf and bought it. Now, years later, I know the difference. If you’re using tofu as a meat replacement, you’re going to want to be buying regular tofu aka “medium, firm, or extra-firm” tofu, not silken tofu. Soft Block Tofu – This is the Chinese style version of silken tofu. You can actually use this similar to how you’d use silken tofu. Medium Block – This type of tofu works great for miso soups and is a bit than silken and soft. Firm/Extra-Firm Block Tofu – this is my favourite form of block tofu. It’s firm, usually found in a bag of water or a package with water and needs to be kept in the fridge. We use extra-firm tofu more than firm. This type of tofu needs to be pressed to remove all of the water in it. You see, tofu is a sponge. You could add all the marinades in the world until you’re blue; if you don’t press it, it would have been a useless talk. It needs that free space to soak up the marinades. More on pressing below. Silken tofu is prepared differently from the above. It doesn’t need to be refrigerated and is usually sold on the shelf or in an aisle. It comes in a box and has little water surrounding the tofu. Silken tofu has a very ‘squishy’ consistency and long story short, cannot be pressed. It can, however, be drained. While it says ‘silken tofu’ on the box but where it can be confusing it that is also says ‘soft, firm, extra-firm’. Silken tofu works well for foods you want to blend, such as smoothies, puddings, cheesecakes and the like. My first interaction with tofu was at a restaurant where they served me this white soggy blob swimming in black bean sauce. No. I later found out that this was silken tofu not being used in the best way. In order to get that crispy on the outside, deliciously seasoned, lovely texture tofu the number step almost every single time (except with silken tofu) is to press it. Pressing your tofu removes all of that liquid from it, leaving room for your tofu to actually soak up your seasonings and marinade. In fact, if you make tofu for meat replacement purposes, and you let it soak overnight in a marinade without pressing it, chances are high that the marinade will have had no effect on the tofu since it just can’t soak it up. You’ll want to press your tofu for about 30 minutes. This is how you ensure that as much of the liquid as possible is removed. I wouldn’t recommend cutting this time down, especially if you want crispy tofu. Use a tofu press. A tofu press is a very simple mechanism that basically screws your tofu into press to press out the liquid. You can adjust it to any level of pressing that you want, and it works wonders. It tastes the fear out of everything on top of your tofu toppling over, and for someone like me who uses tofu so often, it’s paid for itself. Prices range from $20-$30, but it’s probably going to last you for life. Pressing tofu for us now takes less than 5 minutes to set up from cutting up the tofu bag to putting it in the press. The second method is stacking heavy items on top of your tofu to remove the liquid. To press tofu this way, remove from the bag or package and wrap in a kitchen towel. Place a heavy pot (such as a cast iron) on top of the tofu or a stack of heavy books that can balance on top. Press for at least 30 minutes. You can press tofu a day or two ahead of time, and place in an airtight tupperware container in your fridge. There are some recipes where you don’t want to press your tofu as much, or you’re using silken tofu for example. In this case you’ll want to just wrap it in a kitchen towel or paper towel to drain excess liquid from your tofu. This is not the method I recommend when using tofu as a meat replacement. You HAVE to season tofu. Stop treating it like a piece of meat (haha get it). Marinade it in a saucy liquid. One of the best ways to infuse tofu with flavour quickly and all throughout the tofu is to marinade it. You can literally use any meat marinades for tofu, just pump up the flavours. Remember that tofu tastes like nothing, so it’s up to you to really get those flavours singing. You can marinade tofu for anywhere from 15 minutes to overnight. You again want to use extra-firm tofu here so it doesn’t fall apart and so it really soaks it all up. Adding cornstarch into your marinade helps the tofu to crisp up on the outside when it gets pan-fried (see below). Otherwise, you can bake it and it’ll still get crispy. I love to marinade my tofu by cubing it or slicing it, placing it in a pan, then covering it with a sauce. 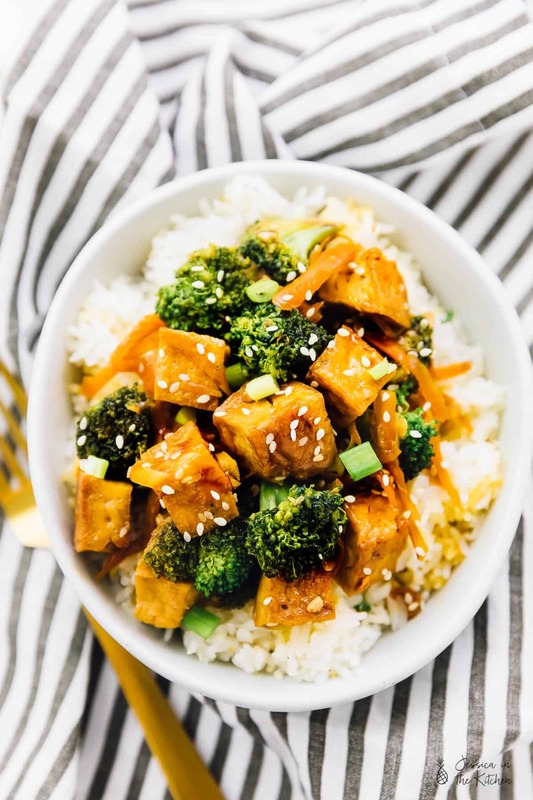 This is an amazing tofu marinade recipe that I love for this baked teriyaki tofu. You could even use the sweet ginger sauce from my Tofu and Veggie Stir Fry to first marinade the tofu, then bake or fry it as you please! Coat it in a lot of dry seasonings. You can also use your favourite potent seasoning mix and coat your tofu in it. Pre-season it, then let it soak in a sauce to soak up flavours. 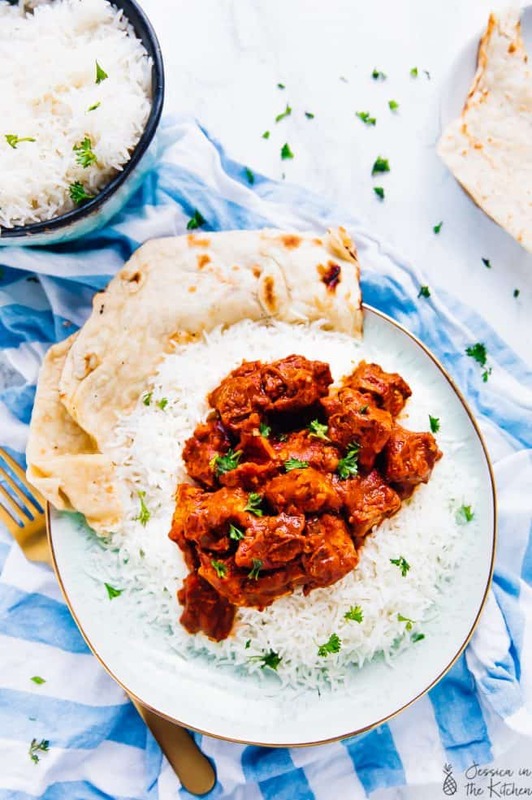 My Slow Cooker Tofu Butter Chicken wasn’t even pre-seasoned, but it was well pressed, and so it truly soaked up the flavours of that sauce. Alternatively, my stove top Tofu Butter Chicken is pressed, coated with cornstarch and a lot of seasonings, then pan fried, then steeped in sauce. Both taste absolutely incredible. It’s all about what method you want to use, when. Like I mentioned above, I’ve made tofu by coating it in cornstarch and seasonings. Cornstarch is a genius way of getting your tofu as crisp as possible on the outside, while keeping it easy. There’s always the breading method, but sometimes it is long and tedious and you want something quick and effective. That’s my cornstarch method for me. I’ll do a bake on crispy baked tofu, but essentially it’s oven at 400 F. Press tofu and cube it. Coat it in garlic, black pepper, salt (plus more of your favourite seasonings), liquid aminos and some olive oil. Then mix it into some cornstarch and toss it all together, then bake for about 20 minutes. Cornstarch also helps to draw out excess moisture so it really gets the tofu crispy. Some of my other favourite one off tips would be to bake and cook your tofu at a high heat. Whether that is pan frying it, or baking it, tofu loves high heat. That way you really get to crisp out the outsides, then you could always lower the heat. Now that you have all the information you need to make the best tofu possible, here are some of my favourite Jessica in the Kitchen Tofu recipes!! Thank you for posting this on how to cook tofu. I had nearly given up on it as it so often tastes like a dry sponge when I cook it. I will try again using your methods. I have tried freezing tofu but it never quite tastes the same after that. I would also like to know if there are certain brands that are better than just supermarket tofus. I LOVE your Spinach and mushroom Tofu Muffins. The flavour is incredible. Aww I’m so happy to hear that this post helped you much!! Totally understand and hope that it really helps you. Honestly, some tofu brands freeze better than others so that might be why you’ve frozen tofu and not loved it. The brand that we use right now is House Foods Organic Tofu in Extra Firm https://www.amazon.com/House-Foods-Organic-Extra-Firm/dp/B000VHRNSO which I love! We’ve also used a local tofu that our Asian supermarket makes (which freezes way better than the House Foods for example). Aww so happy to hear you love that recipe too!! You’re so very welcome and hope that this is helpful! !